Khagrachhari (খাগড়াছড়ি) is a district under Chittagong Division located in the South-Eastern part of Bangladesh. The entire Chittagong Hill Tracts is divided into three circles. They are Mong Circle, Chakma Circle and Bomang Circle. Khagrachhari belongs to the Mong Circle. God decorated this place with immense beauty. Everywhere your eye can see is full of green. An ideal place for travelers. 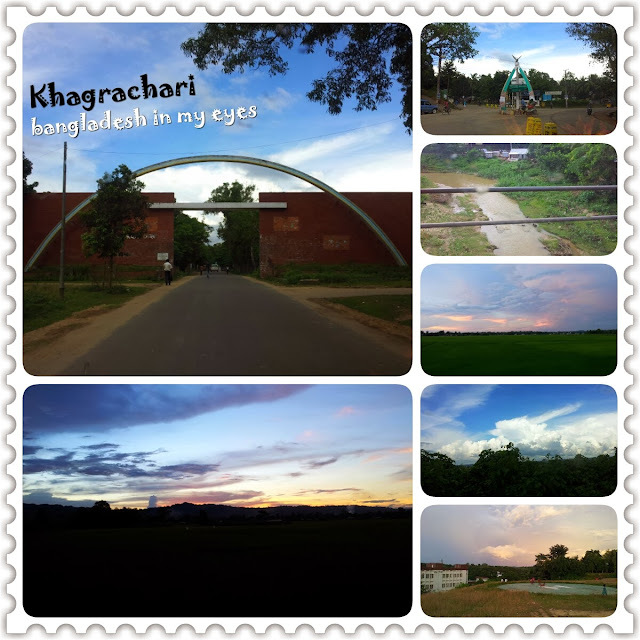 This is my 1st visit to Khagrachhari. It was a half-day tour. Due to shortage of time I can not see the tourist spots. Just took some picture while we were moving by the car. 16th September, 2013 we visited Khagrachari. About 112 km away from the Chittagong Division. You can go directly by Bus or Private car. Another way you can go Chittagong by plan and from there use a car or bus. There are several hotels of different tariffs and facilities. Some of them are: Pajatan Motel, Ecochari Inn, Hotel Shoilo Shuborna and many more. 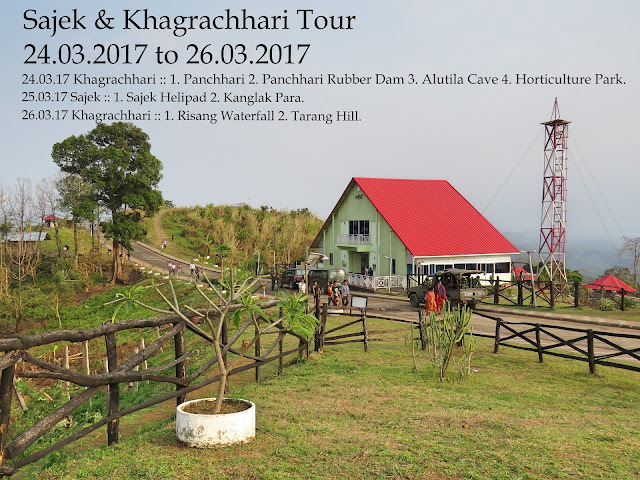 Here is a list of the places that you can visit in Khagrachari. Next time I will try to visit some of this place. Funny thing is while I was in Khagrachari I asked some of the locals about the tourist spot. They can not mention any tourist spot. One of the locals show us inside the town after that we move to Rangamati. Alutila Tourists Spot: Starting from Khagrachari to Chittagong Road about 8 km west from Khagrachari town on the top of the Alutila Hill. Transport: Bus, Microbus, Chader Gari, Private Car etc. Risang Waterfall: About 3 km west from Alutila Tourists Spot. We saw it from a long distance. Alutila Mysterious Cave: It’s in the Alutila Tourist Spot. Debota Pond of Nunchhori: It’s located 11 km south from the Khagrachari town in the Nunchhori Tripura Village, 4 km west from Maishkhali Army camp of Khagrachari to Rangamati road. Almost 1500 feet above the peak of the Mountain is the Debota lake. Shantipur Tree House: 25 km away from the Khagrachari town following the Khagrachari – Panchari road will take you to the Panchari market. From there 5 km south is the Shantipur Tree House located. Panichari Brihot Buddha sculpture: The largest Buddha sculpture of Bangladesh is situated in Panchari. New Zealand: It’s the only plain land in Khagrachari. Local people named it New Zealand. It’s about 10 to 15 minutes far from the main town. We saw this place. Large area used for Paddy cultivation. For more information locals can visit this site. It's in Bangla language. This is an interesting place. It's not a tourist spot it's a restaurant. Probably the best one in Khagrachhari. I like the food and the decoration. We found varieties of food item that are not common in other places. 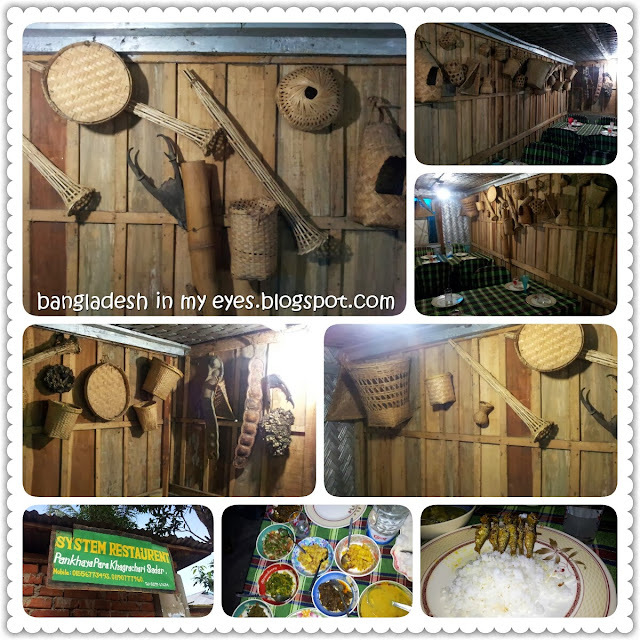 They decorated the restaurant quite nicely with local instruments they use for fish catching, cultivation and daily house work.